Arch chairman Richard Wearmouth with Bedlington councillors and the project team at the completed site. Arch and its successor Advance Northumberland has delivered the scheme, which has created 18 two-bedroom apartments for rent targeted at the over-55 market. They have been highly sought after and all 18 apartments are allocated, subject to references and viewing. The first tenancies are due to commence soon, with full occupancy anticipated by the end of November. 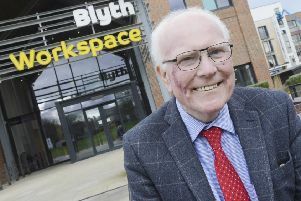 Arch chairman Richard Wearmouth said: “I am very pleased to see the new development is now ready for occupation – this is a positive step forward for the town. “It will help with regeneration of the town centre, providing high-quality accommodation for rent. Each apartment has fitted kitchens and an allocated parking bay. In addition, they are decorated and include carpet and flooring throughout.